The Vox amPlug Series 2 Headphone Guitar Amplifier Blues is designed to deliver the quintessential American amp sound from crunchy rhythm to smooth bluesy lead tones. There are three built-in amp modes to choose from: Clean, Crunch and Lead. Clean offers up a tone that simulates the output of a classic tweed amp, Crunch has that fattened warmth of an overdriven amp with a sizzling high-end, whilst Lead delivers the ideal tone for chunky, blues leads. Wherever you are, all you have to do is plug this beauty into your guitar output, pop in your headphones via the socket, and you're good to go! As with other models in the amPlug 2 series, the Blues is endowed with nine selectable effects (Chorus x 3, Delay x 3, and Reverb x 3), which give you an exceptional breadth of creative control over your signal. The improved cabinet simulation in the Series 2 models ensures a more realistic response. The ingenious multi-stage gain circuit features Vox's proprietary analogue technology in the amPlug models to perfectly recreate that classic distortion that can is achieved by a vacuum tube amp! The amPlug series 2 utilises a foldable jack plug that can rotate through 180 degrees meaning whatever guitar you use; you can put the amPlug series 2 in a position that is unobtrusive and comfortable to reach. This unique design also allows for easy storage in your guitar case or gig bag. The Vox amPlug Series 2 can tell when it's no longer in use and after 30 minutes will automatically power itself off, fantastic function that ensures your batteries will last much longer - up to a whopping 17 hours! 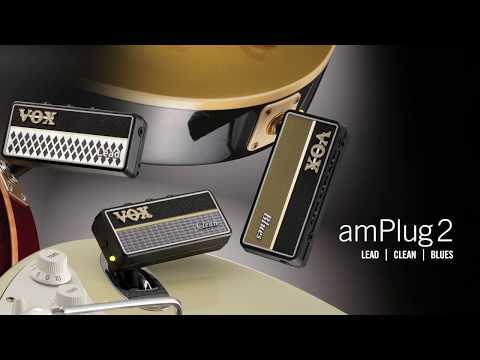 For those that like to practice to music, the Vox amPlug Series 2 can help you there too! The 3.5mm stereo jack input allows you to connect virtually any audio source which is then sent to your headphones along with the amp sound! Jam along with your favourite band or work alongside guitar tracks to improve your playing skills, all through your headphones, thanks to the Vox amPlug Series 2.